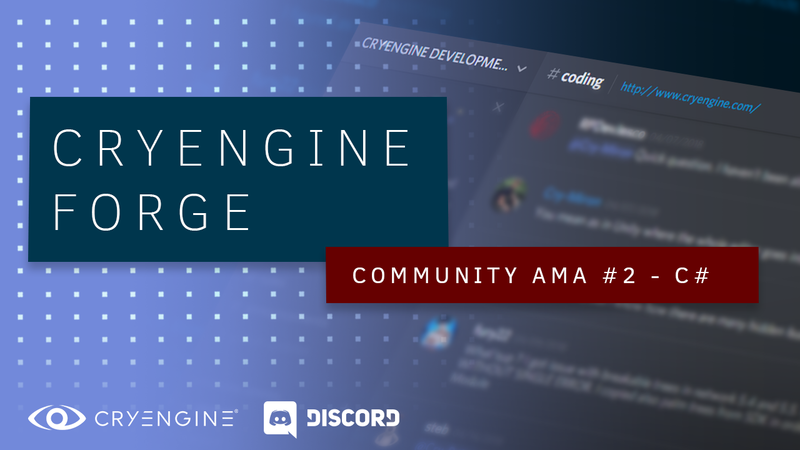 C# Programmer Michael Bosschert and Community Developer Yakir ‘Nic’ Ketteler are available for a live question-and-answer session on our CRYENGINE Community Discord next Friday. You can submit your questions around C# in CRYENGINE and as always, feel free to ask questions about marketing support and licensing. A limited amount of people can come to the voice channel and talk. Please mute your mic while you aren’t actively talking. Before asking a question, please post it in text-chat, so Nic can give the floor to you to ask your question. If you don’t want to speak, Nic can read out your question. Check out our last AMA recording on YouTube to get an idea of the scope and flow! As our resident C# expert, Michael was critically involved in expanding the engine's functionality and systems towards a broader scope of coding options. If you are already a member of the CRYENGINE Community Discord, chances are you met him following up on his patronage over the coding channel; helping to solve issues and trouble-shoot programming challenges. To set a scope for the upcoming AMA, feel free to review our latest interview with Michael about C# in the engine, here. Nic, yours truly and challenged when it comes to writing about himself, will speak a bit more about licensing related questions and registering your game, how CRYENGINE supports Indie Devs with marketing efforts and upcoming events & workshops. He’s also going to take note of your feedback for the team and speak about upcoming opportunities for the community to get the word in on CRYENGINE development. Cry-Flare, formerly known as uniflare in the CRYENGINE community, author of the Splash Screen plugin and the CRYENGINE Beginners Guide on the forum is our community support specialist manning the stations to be in touch with you guys over social media, the forum, Discord and CRYENGINE Answers. Aglája is helping out with the community AMA & Discord channel out of passion for the community, but chances are, even if you haven't talked to her in person, she already helped you in one way or another. If you ever submitted an issue through CRYENGINE on github or the issue reporter in our launcher or forum, she might have been the one trouble-shooting and reproducing your issue to prep it for a fix and then handed it to the respective development team to be processed. You can already submit your burning questions here and now in the comments or on the CRYENGINE Forum & Discord channel in #ama-questionschannel in #ama-questions, so we can prepare more detailed answers for anything that’s a bit out of scope. Live questions can be asked on the spot of course, but it might be a bit hectic, so make sure to submit urgent questions now for our pre-consideration. We’re looking forward to meeting you guys in a more direct approach; as always, questions, comments and concerns – just let us know right here on the Forum, on Facebook, Twitter, Slack or Discord. Hi there, i have question about some unreleased features in cryengine. In source code of Crysis 2 i have found feature called "Weapon Editor". With this feature you can easily modify parametres of weapon with help of fancy sliders and visual preview of weapon attachments / weapon. This feature still being used in cryengine for Warface (game from Crytek Kiev). Why this feature is unreleased? It can be really useful for developing of FPS game. There are so many awesome things you can port from old projects into CE5 or atleast open source code of them. For example .cpf format (Warface) , StatsTool (Warface), LiveSync (CineBox), Batch Render (Cinebox) e.t.c.